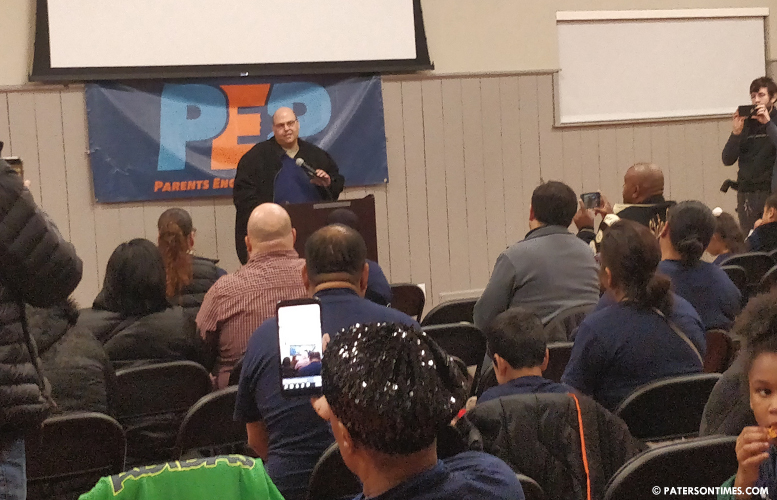 Almost a month after the city’s school board approved a symbolic resolution opposing the opening of any new charter schools in Paterson, a small band of parents from charter schools protested the moratorium on Wednesday evening. Carter was among 25 people to protest the anti-charter school measure at the Paterson Youth Center on Front Street. Some of the parents walked two blocks to John F. Kennedy High School to protest the measure in front of the school board. School board members have argued transfer of millions of dollars to charter schools is eroding quality of education for vast majority of Paterson students. The school district is expected to transfer $55 million in 2018-19 school year, up from $46 million this year. This has created budget shortfalls in the district leading to layoff of hundreds of employees. “The resolution we voted on was not an attack on current charter schools it spoke directly to future charter schools.” said school board member Jonathan Hodges. He said charters schools serve a small number of students at the expense of the district’s almost 30,000 pupils. “It’s a detriment to their educational goals,” he said. Guarasci described the passage of the measure as a “vote of opportunity.” The measure was introduced by school board member Emanuel Capers. The protesters were joined by councilman Andre Sayegh, a candidate running for mayor next year. “This is for all children. It’s unfair to pit parents against parents, children against children, our priority should be a quality education for all children irrespective of where they attend school,” he said. Sayegh, who vowed to be an “education mayor,” would not directly say whether he favored charter schools. The city council has passed a resolution calling for a moratorium on charter schools in 2015. Many of these parents are paid by charter schools to protest. They are funded by Wall Street as a for-profit companies to bilk taxpayers through fraud and other tactics. They don't do background checks to save $$ so they hire sexual predators. The Gulen schools hire teachers from Turkey and force them to pay kickbacks called "tuzuk" which they then use to fund terrorism in Turkey. The charter directors make more the superintendent at 300K . The use scams like "attrition" to maximize profit and lower operating costs…If Charter are soooo great why arent white towns clamoring for them. I applaud Paterson for saying "enough is enough" and stopping the cancerous spread of these scam schools. I always knew something was funny, with all these pop-up schools, it seems sooo easy just to get one started. Come by Wabash ave, at the school of technology?? You’re lucky if you can walk by with ALL THE TRAFFIC BLOCKING THE STREET! There’s no police officer directing traffic plus the parents do whatever they want, double parking, parking on the OTHER SIDE of the street … while facing the wrong way. It’s a mess! But most of the parents sure as hell have some nice taste in cars.. Mercedes, BMW, Range rovers. Yeah, I need a job there too! The teachers make squat, the directors make more than the superintendent. But you cant get a charter unless you bribe the right politicians . Ask the pastors who had their charter proposal turned down. So we are protesting toothless symbolic resolutions now. Makes total sense.